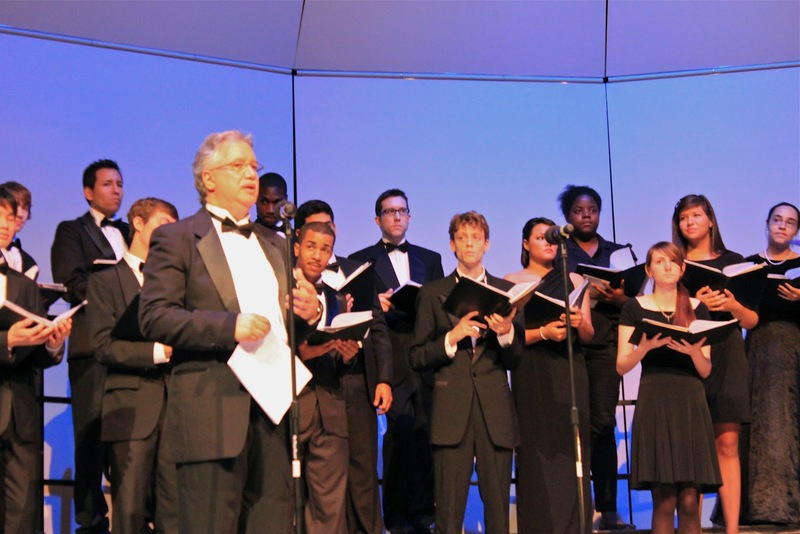 Members of Valencia Singers and Contemporary Ensemble presented a wide variety of music styles at Valencia's Performing Arts Center last week. From classical music by Mozart to a Grammy wining hit by Adele, this concert featured a musical selection spanning over 250 years of history. “We have a number of performing ensembles each semester that range from musical theater to rock band,” said Alan Gerber, director of Valencia's vocal /choral program. He has served at Valencia College since 1999. This relatively small group of 24 singers blended a rich sound with a soft melancholy feel for songs like “Venti Sancte Spiritus” by Wolfgang Amadeus Mozart, and “Requiem” by Eliza Gilkyson. Along with these classics were also two pieces written by Valencia staff members: “I've Known Rivers” by Antonio Brett, and “Olvidando” by Troy Gifford. The groups saved the most powerful piece for last, with “Excerpts from Requiem” by Mozart. The striking sound of this juggernaut of classical music filled the theater with pitch perfect harmonies and commanding crescendos. Individual singers would step forward for featured solos through the performance, aided by microphones to give prominence. “Mr. Gerber is a great instructor; he has a lot of patience and teaches us so much about being a musician,” said singer, Ryin Ryan. He admits the final piece of music by Mozart was the most challenging for the group, but felt this final performance was their greatest. Valencia's Contemporary Ensemble followed the classical portion of the concert with their “Glee” style musical theater showcased by a different group of students. Dancing in choreographed routines, the group performed several hit singles like “Superstition” by Stevie Wonder, “Born This Way” by Lady Gaga, and “Rolling In The Deep” by Adele. “It was just such a wonderful experience for me, being part of this group,” said first year Valencia music student, Emma Carrion. She is planning on joining the same ensemble in the Fall, and hopes more people get involved with the group for their next performance. Audience members were also enthusiastic about the concert production quality and delighted by its range of musical styles. Members of Valencia Contemporary Ensemble perform hit songs with a musical theater style. 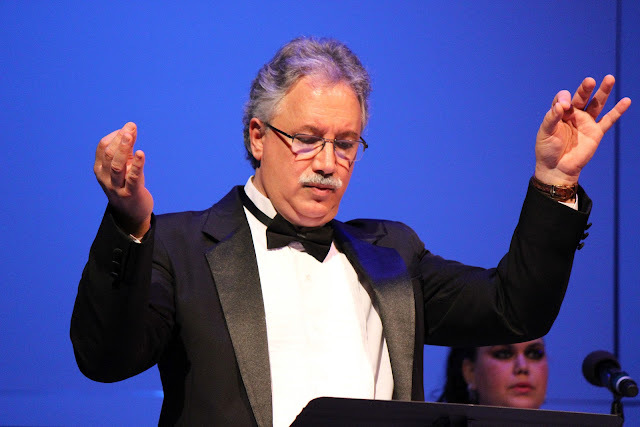 Alan Gerber, Valencia's vocal /choral director, leading the Valencia Singers during the concert.